It's been a busy week - the Goodwood Revival two weeks ago, followed by visits to friends in the south, then back to Manchester for just one day before heading off again last Friday - this time to the beautiful Norfolk coast for the North Norfolk 1940's weekend. Sadly, the trip didn't get off to a good start. The M6 south-bound was blocked for the best part of an hour due to an overturned caravan, then roadworks at Nottingham meant further time added onto an already long journey. And all that before the purgatory that is... the A17. Yes, if there is anything that sums up the catholic notion of purgatory, then this road is it. Anyone who has travelled it knows the tales of mind-numbing horror... anyone who hasn't, well, all I can say is to avoid if at all possible. Flat, drab fields of dull, green vegetation for miles and miles and miles and miles and miles, a single-carriageway road full of slow caravans, slower lorries and crawling tractors, semi-industrial farm units as far as the eye can see, greenhouses, and more greenhouses, lines and lines of cabbages (in the fields, not the roads), more caravans, more cabbages (in the caravans, obviously), no-one overtaking (pointless anyway - there's just another tractor/lorry/two hundred vehicles in front of you... as we found out), roadworks... it is just .............................................................. endless. South Lincolnshire must surely be the dullest part of the country I have ever seen - and at 45mph for an hour and a half I saw a lot of it. I wanted to take a photo of it to remind me how awful it really was, but there was no way our driver was going to stop and lose his place in the 10-mile queue of traffic. Not even with the offer of a blow-job, which just shows how desperate the whole situation really had become. But then, after some five hours travelling, we passed Kings Lynn and reached the edge of Norfolk. Rather quickly the villages turned prettier. Trees began appearing, there were dips and crests and bends in the road, and life, and a sense of hope, returned. And, finally, some six and a half hours after being picked up from my apartment in Manchester city centre, we arrived in Sheringham on the north Norfolk coast. When I explained to the lovely proprietor about our rather long journey, the first thing he said was "You didn't come down the A17, did you?" When I said yes, he looked like he was going to cry, like some poor soul whose long-buried memory of torture had just reared it's head again. There was time for a quick wander around Sheringham before a very well-earned dinner in the nearby village of Holt, (at the truly wonderful Byfords deli-restaurant), before retiring to our fantastic B&B to rest before Saturday. 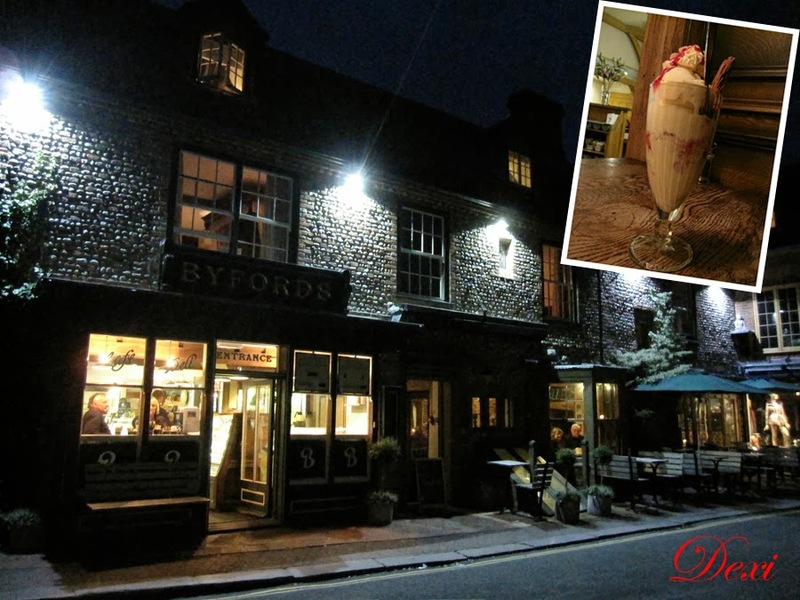 Holt itself was a stunning little town, and it was just as gorgeous as the Sundae I had at Byfords. 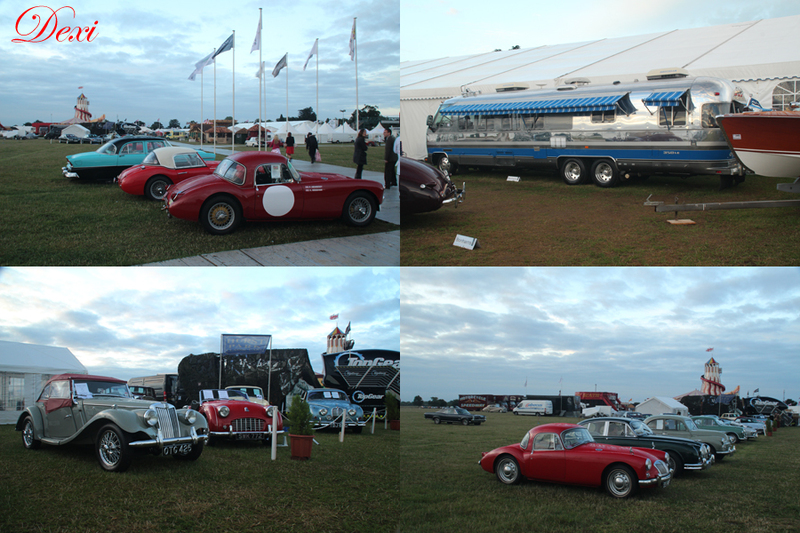 Saturday dawned, and I was happy to see that it looked a lot warmer than the previous weekend at the Goodwood Revival. After dressing (in my lovely satin slip and stockings and suspenders, of course!) and a very hearty breakfast it was time to jump on the lovely steam train at Sheringham Station and head all the way down the line to Holt. Anyway, the station at Holt was absolutely lovely. A very pretty station full of flower displays, surrounded by lush trees, a vintage car display and with a vintage market to boot. I was a very good girl, though, and managed to keep my money in my purse. The pair of black, sheer wrist-gloves that I have been hunting down eluded my searches at Goodwood, and again here sadly. Nevertheless, it was lovely to browse the stalls and enjoy the atmosphere. A chance meeting with friends also meant a great opportunity to sit and have drink in the station cafe and enjoy the sights and sounds of the steam-trains and travellers, many of whom had made a great effort in dressing the part. 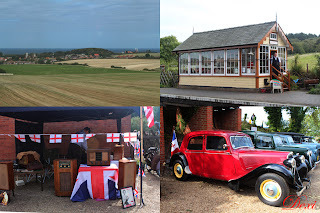 After a while it was time to jump back on the train (this time in the bar coach) and head for the middle station of Weybourne - much smaller than Holt or Sheringham. 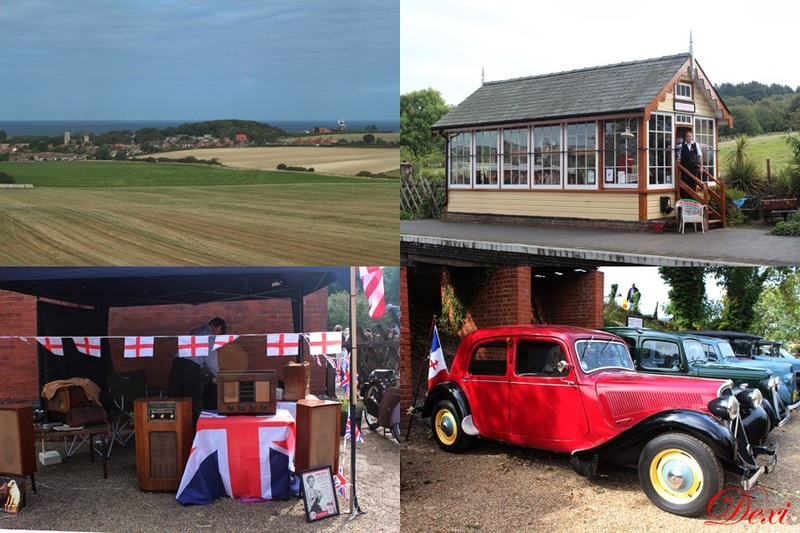 I, of all ladies, know that size doesn't usually matter, and Weybourne was picture-perfect. A little bar serving some tremendous local real ale (lavender and honey ale... mmmm) had been set up behind the station, and in the warm Autumnal sunshine the scene over to the coast was simply stunning. 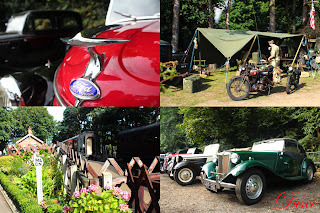 Another fantastic car display, and a DJ playing some great 40's melodies added to the ambience. After a beer or two at Weybourne it was time to jump on the next train (this time in the wooden luggage coach) and head back to Sheringham. 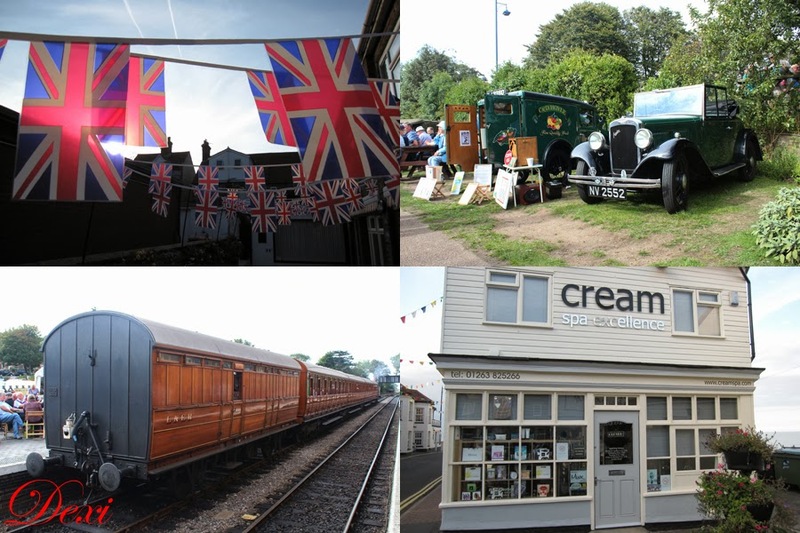 The town was absolutely buzzing and crowded, and even getting off the train at the busy Sheringham station was difficult. The town had made a fantastic effort to get in the spirit of things, and I don't think I saw one shop in the centre that hadn't arranged a fantastic window-display. Flags and bunting abounded, and speakers down the main street sounded the big-band sounds of the 1940's. 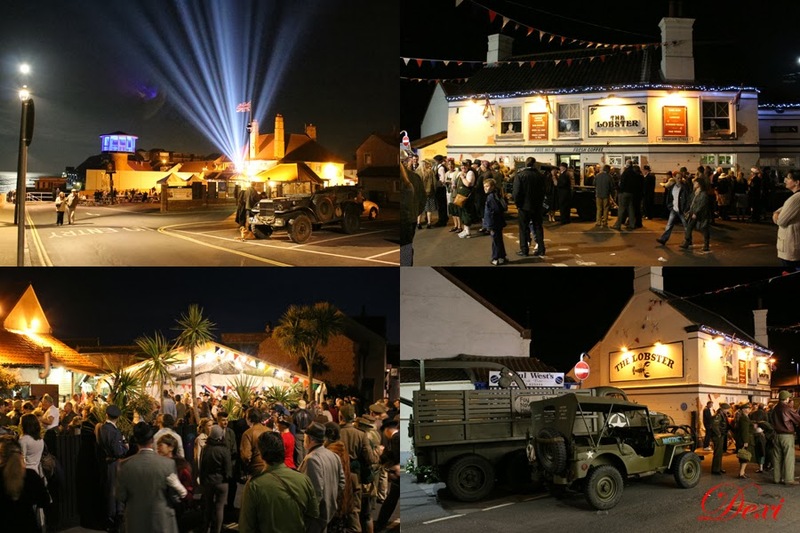 The evening was almost as busy, with the main street full of revellers and a live big-band in the courtyard of The Lobster inn. 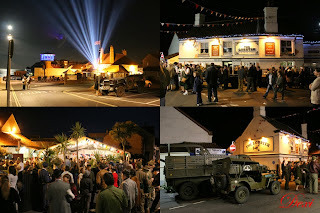 The varied military vehicles still parked around the main square added a distinctly authentic wartime feel to the proceedings, and it was a truly fabulous end to a great day. Back in Manchester and contemplating the weekend has left me in a quandary. 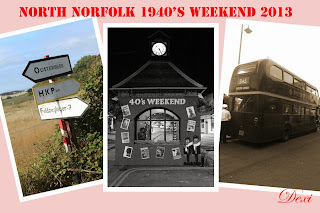 North Norfolk was undoubtedly beautiful, and I'd love to go back and see more of the stunning countryside and villages... but the journey to and from there is more than a little daunting (it still took five and a half hours to get home, without any caravans overturning on the M6!). 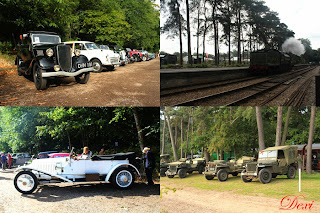 Right now I can say it was a great event, made better by the lovely sunny weather and area, but I will still have to think twice before venturing onto the Road To Nowhere again...! This week's Picture Of The Week is taken from that weekend - Saturday morning, actually, whilst dressing, and caught very nicely in my stockings, suspenders and slip. I am now back in Manchester, and will be back in the Altrincham apartment next week... if anyone wants to have a closer look and feel of those stockings! 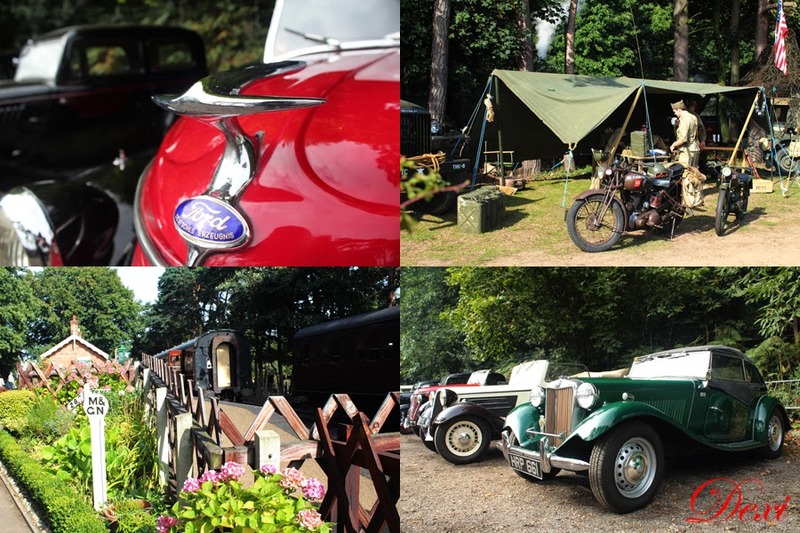 Well, that's it for another year - for those who missed out on tickets for the premier retro car festival will have to wait until September 2014. And of course, the Revival never fails to disappoint. Or does it..? Well, firstly it was a very early morning start on Friday from Manchester to head down to Brighton for the weekend. And by early, I mean 5.00am. A girl like me usually never sees 5.00am unless it's been a long night and I'm heading to bed, so to be awake and ready to leave my warm apartment for that time was a bit of a shock to the system. Despite the best efforts of the M25 at rush-hour and the roadworks on the A23 Brighton road, four and a quarter hours later I found myself on the south coast, and, unable to check into the hotel until 2.00pm, with some time to kill. I was at least ready for the changeable weather, having kept an eye on the forecasts all week, and Brighton was covered by a layer of cloud which occasionally threw down the odd and brief shower. Breakfast called first, duly taken at the Blackbird Cafe in the centre of the town. It was just my kind of place - suitably retro and quaint, but it was a bit expensive. 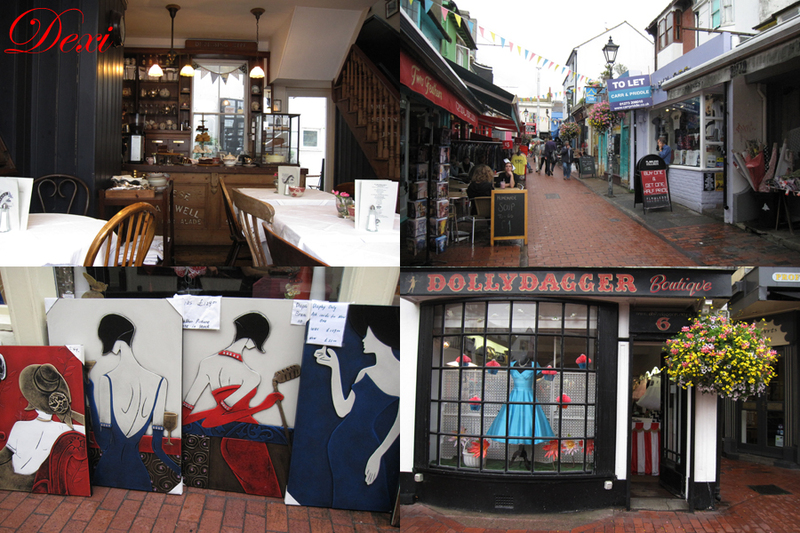 Nevertheless, refreshed, I had a lovely wander around Brighton's lovely Lanes areas before heading back to the hotel to check in. On the evening a group of us gathered at Food For Friends for our customary pre-Goodwood meal, including cocktails, of course. After a few myself, including a blissful 'El Mulato', we had a fantastic meal and it was a rather tiddly Dexi that hit the bedsheets later that evening, very aware that I had another very early morning ahead of me. 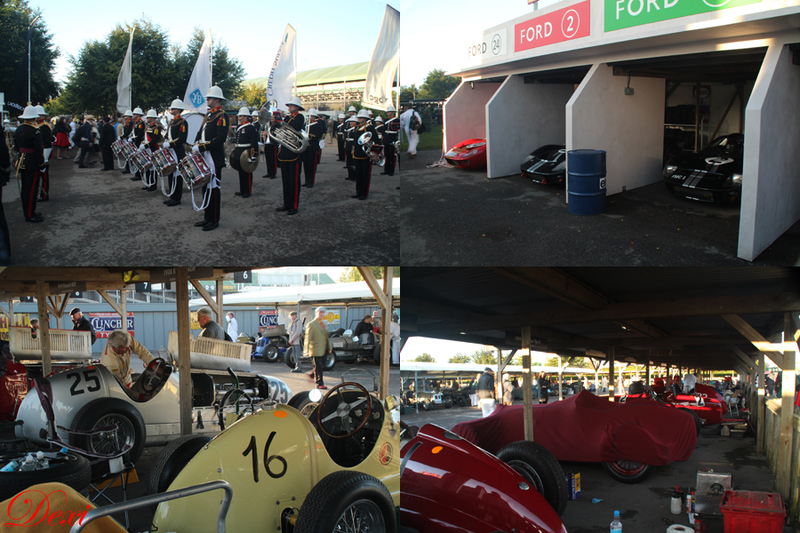 Saturday morning arrived, and by 6.00am we were leaving our hotel for the 30-mile journey to Goodwood. The weather, sadly, meant that my lovely vintage dresses were not an option, and I hoped my vintage suit, stockings, suspenders, and silk slip would offer enough layers to keep me warm. 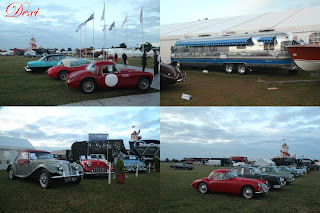 We arrived at the Goodwood circuit by 7.00am, and although the gates to the actual race-circuit didn't open until 7.30am, the outfield area offered enough lovely sights to pass the time, including a red MG A, one of my favourite cars, and a motorhome to die for, entered later that day in the Bonham auction. I'm not sure I could afford it, though, as apparently it managed 1mpg! At 7.30am on the dot, the gates opened to the large crowd that had already gathered, and we filed in to the sounds of the brass band. I love the early morning start at the Revival - it's a real opportunity to see as much as possible before the real crowds arrive later on. This year is also 50 years since the birth of the Ford GT40 programme, and there were lots of these iconic cars on the circuit, as many would be competing in the Whitsun Trophy later that day, and it was great to see them all so close-up without the hustle and bustle of the crowds. The Pits area is another great place to stop before the main crowds arrive. The mechanics are usually busy fine-tuning the cars ready for racing, and the sounds and smells are almost as intoxicating as the El Mulato cocktail from the Friday night! I stood next to one of the GT40's as the mechanic revved the thunderous engine, and the petrol fumes and noise made my eyes water. Bloody lovely. It's not just cars, of course. Goodwood also has a quite impressive history when it comes to aircraft, and the Revival event also hosts the Freddie March Spirit Of Aviation Trophy - awarded to the best vintage aircraft on display. Again, there was some lovely machinery in the Trophy this year, including an amazing German Junkers Ju52 from 1936. 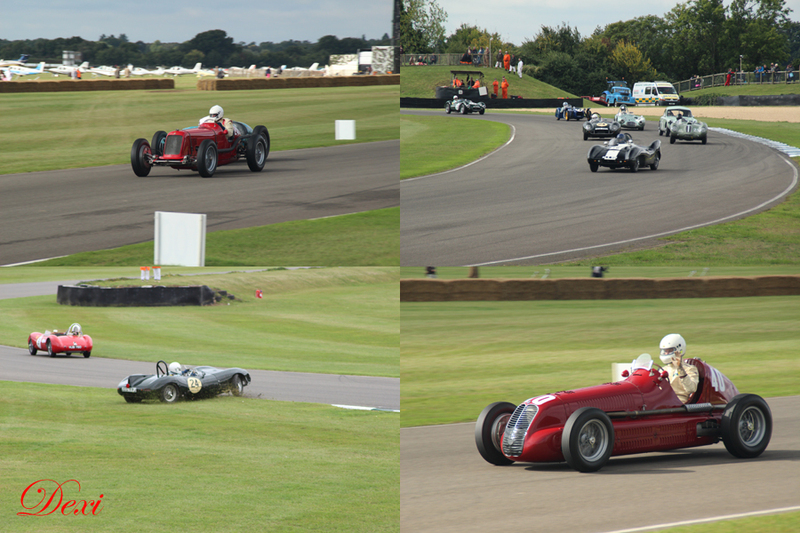 And as always, dotted around the circuit, there are so many fantastic little displays that it's easy to miss them, especially once the crowds gather. 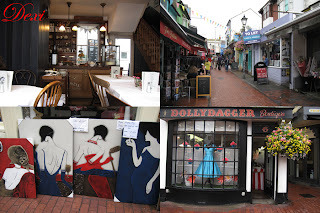 I managed to spend a fair bit of time in the Vintage Market area, and for once didn't spend much at all - maybe my vintage wardrobe has reached a level where I either don't need anything else or I need to get rid of some clothes before getting new ones! 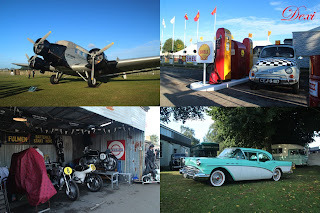 This year, I promised that I would try and see a bit of the racing itself, as usually I miss quite a bit, and my journey to Oulton Park a few months ago rather whetted my appetite. 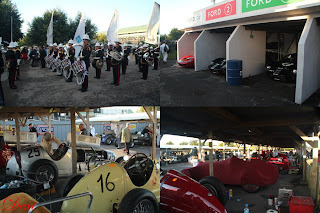 There are larger crowds at the Revival than Oulton Park, of course, so we trooped off up the circuit to get away from the main area in order to see some racing, and I have to say some of it was spectacular. The Magwick Cup provided most of them, as the tiny sports cars found that getting grip on the cold and damp race circuit was pretty difficult. With plenty of thrills and spills and speed, and I even forgot the chilly weather for a while. Yes, sadly, the weather wasn't holding up - although there wasn't much rain (except just enough to make the racing interesting! ), it was certainly cold. My outfit wasn't quite keeping me as warm as I hoped, and our chosen spot next to the racetrack was not exactly sheltered from the wind. However, on the positive side, our new location did mean that we had a great view of the aerial displays of the Spitfire, Mustang and Curtiss Warhawks. We were also privileged to see the longest-serving aircraft in RAF history - the Canberra, the RAF's first jet aircraft. Not quite as ground-shaking as the Vulcan in terms of sheer decibels, but loud enough as it accelerated away from the circuit. I did manage to see one last race, too - the Whitsun Trophy, featuring an all-GT40 line-up, and the sound and sight of those fantastic cars as they hurtled around the track was unbelievable - especially with flames shooting from the car's exhausts as they braked. Quite astonishing. By 5.30pm sadly I was tired enough to call it a day, and left with some tremendous memories. However, of all the times I have been, this was certainly the coldest, which took some enjoyment off the day for me. It is also is getting busier and busier, and the crowds are making it harder and harder to see anything or actually get anywhere. Of course, the chances are that I will be returning, as it is still a great day, and will no doubt provide lots of memories and smiles as I look back at the photographs in the weeks to come. Speaking of photos, on my way back from Goodwood I called in to see a lovely photographer friend who needing a little modelling doing for his new website. I was more than happy to help out, and have even managed to get a few pictures done for myself too at the same time. Hopefully some of them will be on my website in the next few weeks, and I will of course keep you updated on that! Yes, this week it's just a quickie - a quick note that is. Stop being rowdy at the back! I'm very mindful (as in looking forward to it everyday!) 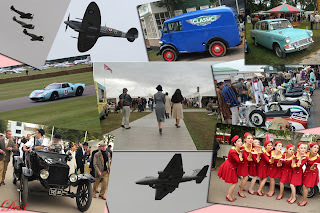 that next week is the Goodwood Revival, and I will be enjoying a few days in Brighton, then heading off to see a very good and lovely friend for something very specific in mind - you'll learn more next week! With this very much in my thoughts, this week's Picture Of The Week (as always, on the Gallery Page of my website) will have to also suffice as next week's Picture Of The Week, as I won't be in Manchester to update it. Again, with retro things filling my head at the moment, I've gone for a sort of retro theme - namely, those old "Carry On..." films - only, this is my take on it. It was taken at the fabulous Ess & Emm bed and breakfast dungeon in beautiful Warwickshire, and I hope you like it. Oh well... I'm sure I'll have plenty of photos from next week to make up for it!